The Book of Mormon begins long before you step into the theatre. London is adorned with its posters, our offices echo with remembered jokes and songs. As you enter Leicester Square, you are bottlenecked towards the Prince of Wales – particularly if there’s a film premiere – and when you step up to the theatre, you are encircled by queues for entry and ticket collection alike. The atmosphere is spellbinding, and the weight of expectation is colossal. My expectations were emphatically met – The Book of Mormon was an unfettered, joyful show that had us heartily laughing throughout. It is rare to see a performance where the audience are quite so on the company’s side. After all, the show’s cultural status, coupled with the price of tickets, makes one hard pressed to imagine a sceptical viewer. Indeed, even if you are unfamiliar with The Book of Mormon’s premise, it is widely known that familiarity with Matt Stone and Trey Parker’s oeuvre (and South Park in particular) provides the perfect litmus test for your enjoyment. 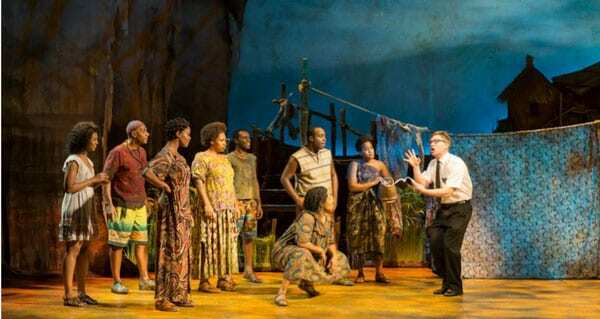 Though The Book of Mormon lacks the biting satirical edge of their most famous creation, it maintains its slightly silly humanism, lending surprisingly thoughtful undertones to a high octane piece. I think it’s worth avoiding specifics about the narrative before seeing this show, so I will keep my introduction brief. Elder Price (Nic Rouleau) is the golden boy of his missionary training centre, and dreams of two year mission in Orlando, Florida. He is assigned the socially awkward Elder Cunningham (Brian Sears) as his companion, and things go downhill from there. Firstly they are not sent to Price’s arcadia, but to Uganda. They are mugged on arrival, tunefully informed that God is not all he’s cracked up to be (via the earworm “Hasa Diga Eebowai”) and warned of a despotic General (Chris Jarman). Price’s crisis of faith is exacerbated by the revelation that the elders already stationed in Uganda (led by Stephen Ashfield’s Elder McKinley) have failed to convert a single person to their church. Yet local girl Nabalungi (Alexia Khadime) offers a glimmer of hope, for she is free of cynicism and has influence over the village. Can Price and Cunningham bring glory to their church, in spite of all their obstacles? As you might guess, the narrative is largely inconsequential. Rather it offers a platform for a variety of vastly entertaining songs, punctuated by dialogues about the nature of belief and the functions of religion. It gently mocks the Mormon faith, but its practitioners are clearly the good guys. Crucially, the stellar cast ensures that they are enormous fun to be around. 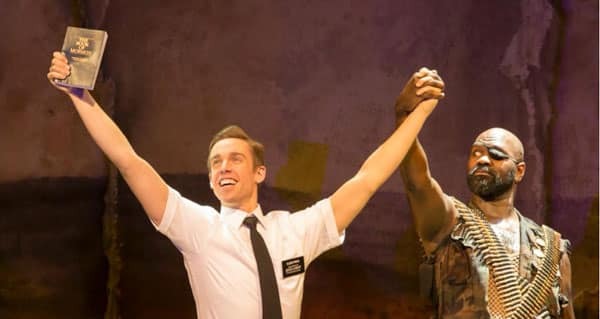 Nic Rouleau sparkles as the self-obsessed Elder Price, bringing an irrepressible joie de vivre to the early numbers (“You and Me (But Mostly Me)” and “All-American Prophet” were performed to hilariously egotistical effect) and an amusingly bitter edge to his descent in fortune. Brian Sears’ Elder Cunningham naturally takes a little getting used to (the character doesn’t have much of an indoor voice), but his faultless energy and strong comic timing is compelling throughout. As he takes centre stage, he easily becomes the philosophical heart of the piece – though he is at his most memorable during the tender, innuendo laden “Baptize Me”, a scene shared with faux Disney princess Nabalungi. Alexia Khadime’s sweet and charismatic performance will live long in the memory. Her Nabalungi’s ‘I Want’ song “Sal Tlay Ka Siti” was a pitch perfect parody of dreams of a better world, and her emotional range was deeply impressive throughout. Stephen Ashfield’s sexually repressed Elder McKinley was a joyful stage presence, especially in the blackly comic “Turn it Off”, and Richard Lloyd King deserves great credit for his excellent Mafala Hatimbi, who exerted a convincing fatherly influence over the free-spirited Nabalungi. The choreography and set design were simply marvellous. Casey Nicholaw should be extremely proud of his performers, who danced with dexterity, creativity and without a hint of a misstep. Scott Pask’s set design was inventive and immersive, from the saccharine Orlando backdrop which made way to a “Spooky Mormon Hell Dream” (complete with a guitar playing Satan), to the Ugandan slums which served as locale for the bulk of the show. 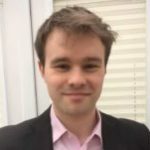 Given how The Book of Mormon deconstructs and reconstructs religion’s ability to help people in times of crisis, it was vital that the backdrop were suitably hellish. Pask’s Uganda is unrelentingly bleak, an arid wasteland littered with forlorn houses, starkly contrasting his Utah. It is truly the perfect backdrop to ruminate on how things have gone wrong. If you are a fan of Matt Stone and Trey Parker’s previous work, you will adore The Book of Mormon. The cast are sublime, the songs are memorable and the choreography is impeccable. It may be the most enjoyable two hours you spend this year.